The Internal Medicine Training Program at Billings Clinic is designed to provide broad-based clinical training. The learning model will integrate competency-based residency training into a patient-centered medical home and the existing Accountable Care Organization. The goal of our program is to provide general internal medicine specialists for our region. We will enable residents to develop the individual knowledge, skills, and attitudes, and the teaming skills necessary to fulfill roles in high-functioning clinical systems. This expanded and collaborative model of collective competence is particularly suited to our rural, underserved region. Teaching faculty are members of a unified, multispecialty group practice with shared values and culture. We are committed to Personal Service Excellence, to focus on service to our patients and staff as a core value. We are also committed to Operational Excellence, based on tools of Lean Six Sigma, to eliminate waste and defects. This organization framework has allowed Billings Clinic to be a national leader in clinical quality, patient safety, service, value, and delivery system reform. As a physician-led organization, we enact the core principles of physician leadership and a team approach to patient care. This focus on quality, safety, and leadership is foundational to resident education. Research opportunities at Billings Clinic include the Center for Clinical Translational Research, the Clinical Research Center, the Cancer Research Center, and the Nursing Research Council. Our research faculty have considerable experience translating health services research into practice and have created a strong research training program to support and mentor scholarly and research activities for residents. Have a Passion for Research? 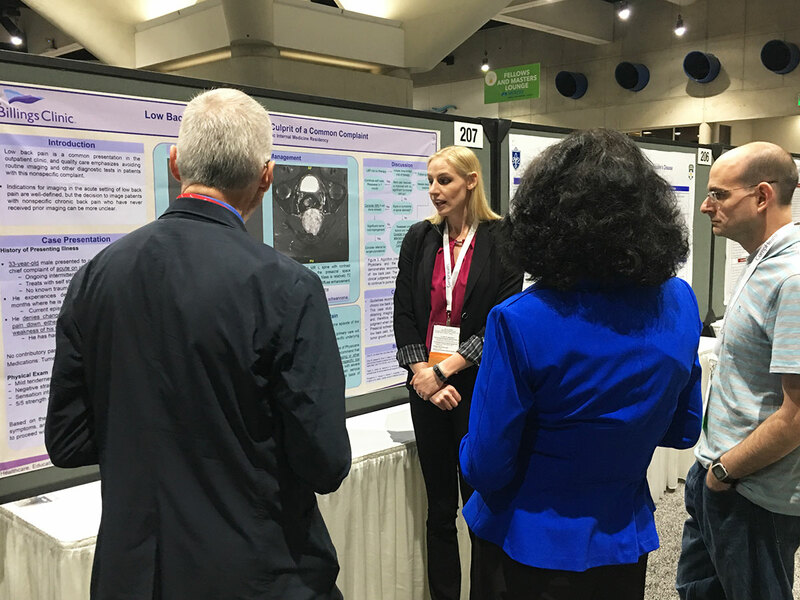 Thanks to the generous support of the Leona M. & Harry B. Helmsley Charitable Trust, every first-year Resident is invited to propose original research focused on some aspect of rural health care. Based on competitive judging of all proposals, two Residents each year will be selected as ‘Helmsley Scholars’. Helmsley Scholars will be paired with a mentor conducting research in the field, receive funding for data collection and analysis, and participate in a funded opportunity to present research findings at a regional or national conference. Research entities at Billings Clinic include the Center for Clinical Translational Research, the Clinical Research Center, the Cancer Research Center, and the Nursing Research Council. Our research faculty have considerable experience translating health services research into practice and have created a strong research training program to support and mentor scholarly and research activities for residents. 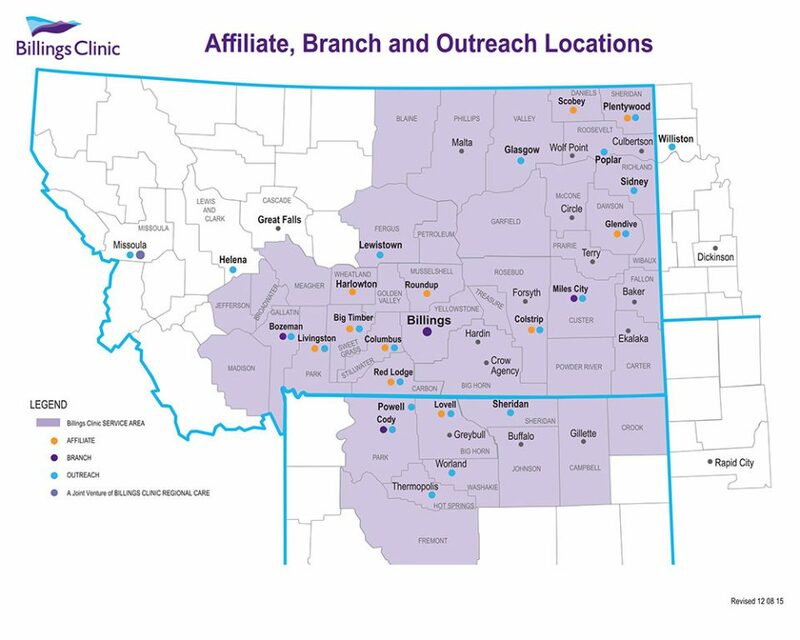 Billings Clinic is a non-profit, multispecialty, fully integrated health care system that provides primary and specialty regional medical care to a wide geographic area encompassing much of Montana, northern Wyoming, and parts of western North and South Dakota. With a regional population of more than half a million, Billings Clinic provides services to a socioeconomically diverse group of patients, encompassing the urban population of Billings, small rural communities, and several Native American reservations. As the largest health care organization in Montana, our 304-bed, more than 400-physician institution possesses expertise in nearly every aspect of adult medical care, providing residents with a robust clinical experience. In addition to our 90-bed rehabilitation and assisted living facility, residents interact with numerous satellite facilities, nursing homes, transitional care facilities and critical access hospitals in the region. Each of our PGY2 and PGY3 residents experiences the ‘real world’ of the General Internist in a rural community through our Rural Rotation Program. You will spend one month at Central Montana Medical Center (Lewistown, MT), a 25-bed Critical Access Hospital, and one month at Sheridan Memorial Hospital (Sheridan, WY), an 88-bed community hospital. Through these rural rotations you will gain insight into the exciting possibilities and practical problems of health care delivery in a remote, rural setting. Click image to enlarge for viewing, downloading, or printing. Teaching faculty are members of a integrated, multispecialty group practice with a common culture – Personal Service Excellence – which focuses on service to our patients and staff as a core value. This organizational framework has allowed Billings Clinic to be a national leader in clinical quality, patient safety, service, value, and delivery system reform. As a physician led organization, we teach the core principles of physician leadership and a team approach to patient care. This focus on quality, safety, and leadership is a core element of resident education. An integrated, collaborative learning environment. Our education curriculum is closely aligned with state-of-the-art approaches to teaching and learning for students, residents and faculty.activities, giving our learners the opportunity to see how cutting-edge teaching and health services research is translated to improved patient care. Outstanding faculty and mentors. Our faculty members are leading physicians who are passionate teachers, committed to providing mentorship and guidance through every step of training to ensure each resident’s success. Nationally recognized resources. Our residents learn in an advanced medical centers, offering the highest quality medical facilities, state-of-the-art medical technology, and a superior medical and allied health staff. Unique education models. Our innovative education models provide a flexible curriculum and continual assessment and evaluation to ensure that each resident receives superior training and is prepared to meet the challenges of an ever-changing health care environment. Funded rural health rotations in rural training sites to enable our residents to function as superior providers in our environment of Montana and Wyoming, which covers large areas, with low population density and variable levels of patient care resources. Medical students from the University of Washington WWAMI Program and Roslind Franklin University of Medicine and Science are in our inpatient teaching services and our clinics.